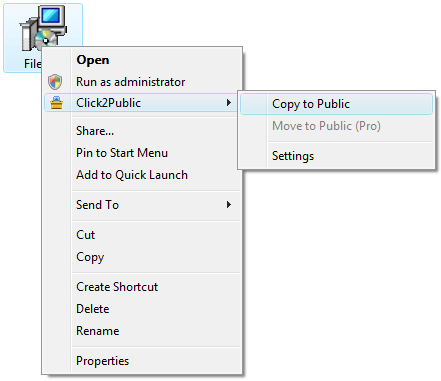 you can simply right-click on the file and choose “Copy to Public”. That’s it! Click2Public will do the rest automatically. It’ll even go as far as to place the URL pointing to your newly uploaded file right into the Windows clipboard, allowing you to paste the link into a blog post, Skype conversation or comment right away. 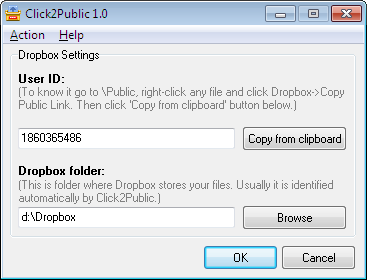 Click2Public comes in both free and paid versions. The free version is entitled for personal use and offers to copy files while the pro version allows you to move files too and also allows commercial usage. Commercial version costs $14.95 and can be purchased using this link. The software is now in version 1.0. Buying the program now will ensure you get all future updates of it to versions 1.x free of charge. Click2Public can be downloaded using the following link. Its a 903 Kb download. The installer is not digitally signed. During installation administrative right is needed. Installation is clean and fast and requires only 2.4 Mb of free disk space. After installation, an webpage will open which will show you the usage of this software. This entry was posted in Download Management, Free, Online Service, Software, Windows and tagged ArcticLine Software, Dropbox.